There's been a bit of a brouhaha over a statement made by a Fairfax County official, Supervisor John Cook, who wants to cut out funding for bicycle facilities in their county (article here). He said, "I don't believe a bicycle is a transportation device. I think it's a recreation device. The big problem is people don't want to ride their bike in the rain or get sweaty before work." I sent the Commissioner this letter. I read in the Examiner your quote that you believe bicycles are not transportation. I can assure you that is not the case. As a long-time bike commuter (yes, I sweat and ride in the rain--as do hundreds of others) I have met and seen literally thousands of people who use their bikes to get where they need to go. I live in Arlington County, but for about a year I worked for a company in Herndon and then Reston. I biked there at least 90% of the time. Every single day: summer, winter, fall, spring, I would see other cyclists riding both ways on their way to work or otherwise. I don't work there any more, but not long ago I biked to to the Fair Oaks Mall to see a doctor at the Kaiser facility there. I generally bike to my dentist in Tysons, and, recently, pulled my daughter on her trailer bike to her dentist appointment there, too. We also often bike to her orthodontist in Seven Corners and her dance studio in Bailey's Crossroads. If that's not transportation, what is? 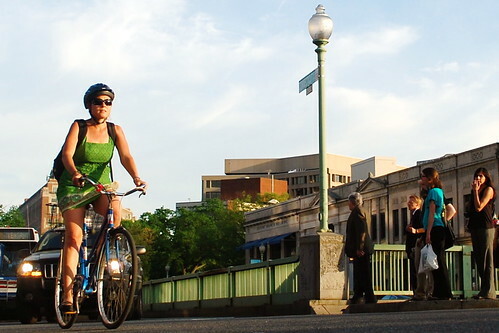 I would strongly suggest you go out to the W&OD some weekday morning in May or June (yes, it's true, fewer cyclists ride in the winter) and watch. Even better, why don't you participate in Bike to Work Day on May 15. Perhaps you saw the press release from the County. Six of the 23 pit stops this year will be in Fairfax County. I'm sure FABB or WABA would be pleased to provide you with a bike buddy to help you get there. Clearly you were just speaking from your own limited viewpoint. I believe it's always a good idea to gather facts and data first before making an assertion based just on one's own personal experience. Had you done that, you would have learned that bicycling is rapidly growing in the region, the number of bike commuters is rising every year, and that even in Fairfax County there are thousands of residents who use their bikes both for transportation and recreation. Good luck to you, and I hope that you are able to make it out to Bike to Work Day this year. Sign up early, and you can get a free t-shirt.